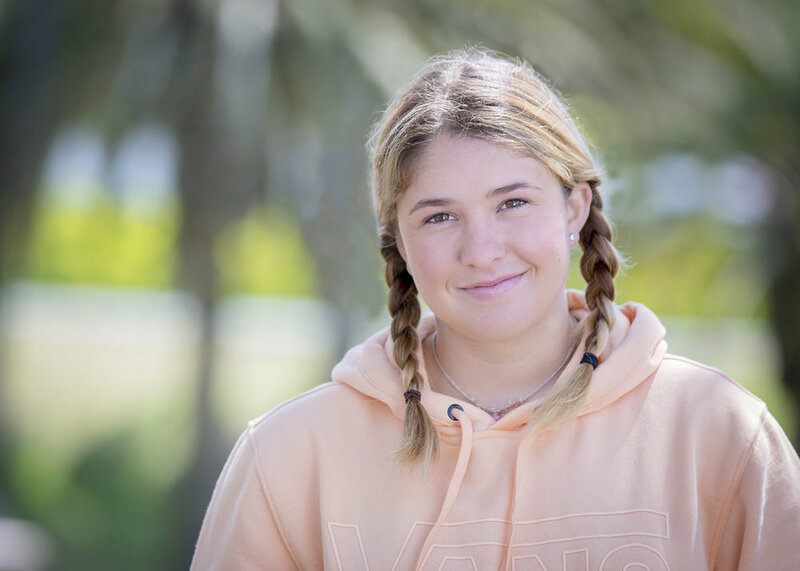 Nineteen-year-old Jordyn Barratt is a championship skateboarder and surfer who grew up in the surf mecca of Haleiwa, on the North Shore of O`ahu, Hawaii. She recently graduated from high school in San Diego County, California, with a 3.8 GPA and was captain of her Surf Team. She competes in both Skateboarding and Surfing events around the world. Her recent accomplishments include first place in the Pro Division at the VANS Combi Classic and first place at Bondi Beach, Australia in Bowl-a-Rama. She is a two-time XGames medalist, winning a bronze in her rookie year in 2016 and a silver in 2017. In 2016 she made history at the VANS US OPEN of Surf where she was the first girl ever to compete in both skating and surfing, and she ended that event on the podium for Skateboarding. Her goal now is to compete in the Tokyo Summer Olympics in 2020, the first year skateboarding will be an official Olympic sport.